New Best of BCS Year Eight Anthology Out on Kindle, iTunes, and More! Our new anthology The Best of BCS, Year Eight is out today at major ebook retailers like Kindle Store and iTunes! 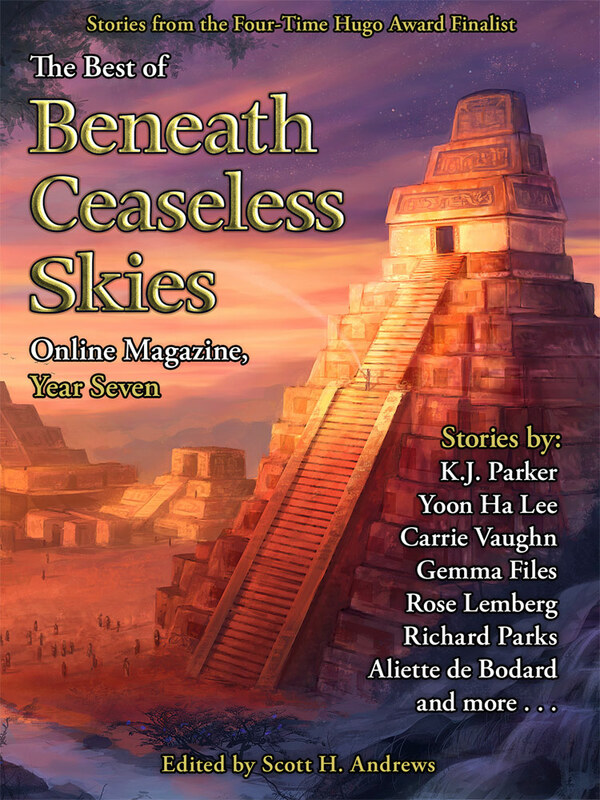 Best of BCS, Year Eight contains sixteen great stories from the eighth year of BCS, by authors such as Catherynne M. Valente, K.J. Parker, Mishell Baker, Yoon Ha Lee, Aliette de Bodard, Rich Larson, Rose Lemberg, and more. It includes “Blood Grains Speak Through Memories” by Jason Sanford, a finalist for the Nebula Awards. The Best of BCS, Year Eight is now available for only $3.99 at ebook stores, including Amazon Kindle, B&N, iBooks/iTunes, Kobo, and Weightless Books. All proceeds go to pay BCS authors and artists for their work. Pick up a copy today, to get some great BCS stories in a handy collection and support us at the same time. Thank you! Our new anthology The Best of BCS, Year Eight is out early today at WeightlessBooks.com, with a free extra as part of our Ninth Anniversary! 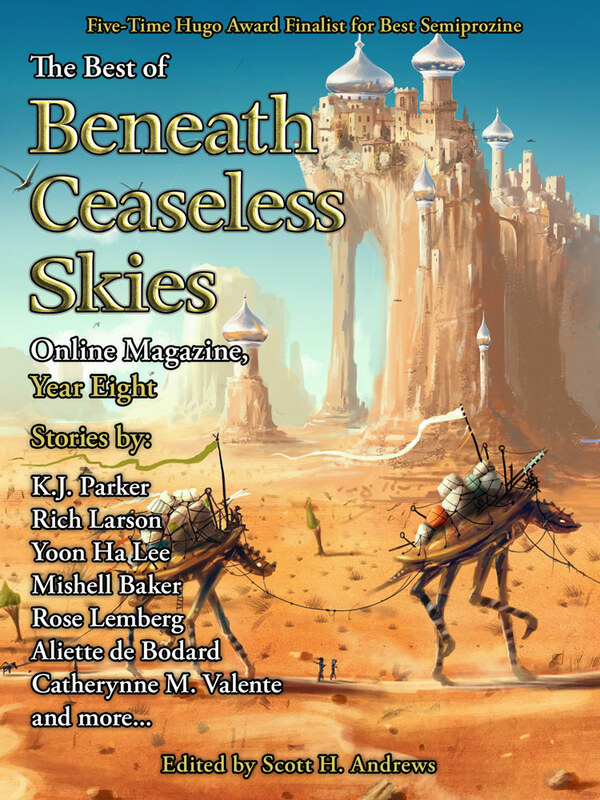 Best of BCS, Year Eight contains sixteen great stories from the eighth year of BCS, by authors such as Catherynne M. Valente, K.J. Parker, Mishell Baker, Rich Larson, and Rose Lemberg. It includes “Blood Grains Speak Through Memories” by Jason Sanford, a finalist for the Nebula Awards, “The Limitless Perspective of Master Peek, or, the Luminescence of Debauchery” by Catherynne M. Valente, a finalist for the Eugie Foster Memorial Award, and “Foxfire, Foxfire” by Yoon Ha Lee and “A Salvaging of Ghosts” by Aliette de Bodard, finalists for the Washington Science Fiction Association Small Press Award. Best of BCS, Year Eight is available early exclusively at WeightlessBooks.com. It costs only $3.99, and all proceeds go to pay BCS authors and artists for their work. Buy now and, as part of our Ninth Anniversary celebration, you’ll get a coupon for 30% off BCS issues at Weightless Books, including all BCS Ebook Subscriptions, 25-, 50-, and 100-issue bundles of back issues, and all 230+ single back issues, some not available anywhere else. Use it to buy a BCS Ebook Subscription (less than $16 for 26 issues/a whole year), any back issues you missed, or to renew an existing subscription (you can renew at any time, no matter when your subscription expires). Get BCS issues conveniently delivered to your e-reader and support the magazine at the same time! Coming soon: our new ebook anthology The Best of BCS, Year Eight! Best of BCS, Year Eight will feature sixteen great stories from the eighth year of BCS, by authors such as K.J. Parker, Mishell Baker, Rich Larson, Chaz Brenchley, Rose Lemberg, and more. It will include “Blood Grains Speak Through Memories” by Jason Sanford, a finalist for the Nebula Awards, “Foxfire, Foxfire” by Yoon Ha Lee and “A Salvaging of Ghosts” by Aliette de Bodard, both finalists for the WSFA Small Press Award, and “The Limitless Perspective of Master Peek, or, the Luminescence of Debauchery” by Catherynne M. Valente, a finalist for the Eugie Foster Award. Look for Best of BCS, Year Eight soon at WeightlessBooks.com and next month in Kindle Store, Kobo, B&N, and other fine ebook retailers. It will cost only $3.99, and all proceeds will go to pay BCS authors and artists for their work. In conjunction with BCS #209, our Eighth Anniversary Double-Issue, and the new Best of BCS Year Seven anthology, we’ve giving away a signed copy of Carrie Vaughn’s new short fiction collection Amaryllis and Other Stories! Amaryllis and Other Stories contains eighteen of Carrie’s stories, including “Sun, Stone, Spear” from BCS #169 and podcast BCS 146. “Sun, Stone, Spear” is also in The Best of BCS, Year Seven, our new anthology from the last year of BCS, which includes stories by K.J. Parker, Yoon Ha Lee, Aliette de Bodard, Fran Wilde, Rose Lemberg, and more. To enter, comment on this post (here) and tell us your favorite story that’s in Best of BCS Year Seven. You must leave your comment on this Amaryllis and Other Stories Giveaway post. Comments left anywhere else will not enter you in the giveaway. You must mention a story that appears in Best of BCS Year Seven. Comments that do not mention a story that appears in Best of BCS Year Seven will not enter you in the giveaway. You must post your comment before midnight PST on Thurs. Oct. 6. Any comments posted after that will not be eligible. Entrants will be entered in a random drawing to win the book. BCS will conduct the random drawing from all eligible entries. The copy of Amaryllis and Other Stories, which is signed to BCS, will be mailed to the winner. You must use a valid email address when you submit your comment (otherwise we won’t be able to contact you if you win). Each person will be entered only once in the random drawing (even if you leave more than one eligible comment). BCS is not responsible for comments that get lost or caught in our spam filtering or don’t show up in our system, or email addresses that get garbled or otherwise rendered unusable for contacting an entrant. This promotion is in no way sponsored, endorsed or administered by, or associated with, Facebook or Twitter. Participants are providing information to BCS and Firkin Press and not to Facebook or Twitter or anyone else. Anniversary Ebook Sale on BCS Subscriptions and Best of BCS Seven! To celebrate the eighth anniversary of BCS and our new ebook anthology The Best of BCS, Year Seven, we’re having an Eighth Anniversary Ebook Sale! Buy or renew a BCS Ebook Subscription or buy Best of BCS Year Seven at Weightless Books, and you’ll get a free BCS anthology of your choice. Best of BCS Year Seven has eighteen great BCS stories by authors such as K.J. Parker, Carrie Vaughn, Yoon Ha Lee, and Aliette de Bodard, including “Grandmother-nai-Leylit’s Cloth of Winds” by Rose Lemberg, a finalist for the Nebula Awards. BCS Ebook Subscriptions are still only $15.99 for a whole year/26 issues (that’s less than 30 cents a story). Subscribers can get issues delivered directly to their Kindle or smart phone (any device with an email address), and they get new issues early, a week before the website. A free BCS anthology is a $3.99 value. Choose any of our Best of BCS anthologies (which include multiple stories by Aliette de Bodard, Yoon Ha Lee, Marie Brennan, Richard Parks, Gemma Files, Seth Dickinson, E. Catherine Tobler, Alex Dally MacFarlane, Gregory Norman Bossert and more) or our theme anthologies Ceaseless West and Ceaseless Steam. The ebook subscriptions and anthologies are also a great way to support BCS–all proceeds go to pay our artists and authors. The sale will end soon, so make sure you buy your BCS subscription or Best of BCS Year Seven at WeightlessBooks.com now! New Best of BCS Year Seven Anthology Out on Kindle, iTunes, and More! Our new anthology The Best of BCS, Year Seven is out today at major ebook retailers like Kindle Store and iTunes! The Best of BCS, Year Seven has eighteen great stories from the seventh year of BCS, by such authors as K.J. Parker, Carrie Vaughn, Yoon Ha Lee, Aliette de Bodard, Richard Parks, and Gemma Files, Rich Larson, and Fran Wilde. It includes “Grandmother-nai-Leylit’s Cloth of Winds” by Rose Lemberg, a finalist for the Nebula Awards. The Best of BCS, Year Seven is now available for only $3.99 at ebook stores, including Amazon Kindle, Kobo, B&N, iBooks/iTunes, and Weightless Books. Our new anthology The Best of BCS, Year Seven is out early today at WeightlessBooks.com, with a free extra as part of our Eighth Anniversary Ebook Sale! Best of BCS, Year Seven contains eighteen great stories from the seventh year of BCS, by authors such as K.J. Parker, Carrie Vaughn, Yoon Ha Lee, Aliette de Bodard, Richard Parks, and Gemma Files. It includes “Grandmother-nai-Leylit’s Cloth of Winds” by Rose Lemberg, a finalist for the 2015 Nebula Awards. Best of BCS, Year Seven is available early exclusively at WeightlessBooks.com. It costs only $3.99, and all proceeds go to pay BCS authors and artists for their work. Buy now and, as part of our Eighth Anniversary Ebook Sale at Weightless Books, you’ll also get a free second BCS anthology of your choice! Choose from all our other Best of BCS anthologies (which include multiple stories by Aliette de Bodard, Yoon Ha Lee, Marie Brennan, Richard Parks, Gemma Files, Seth Dickinson, E. Catherine Tobler, and more) or our theme anthologies Ceaseless West and Ceaseless Steam. Get two convenient ebooks of great BCS stories for the price of one, and help support the magazine at the same time. Anniversary Ebook Sale on BCS Subscriptions and Anthologies! To celebrate the seventh anniversary of BCS and our new ebook anthology The Best of BCS, Year Six, we’re having another ebook sale! Buy a BCS ebook subscription or the new Best of BCS Year Six from WeightlessBooks.com, and you’ll get a coupon code inside the book for 30% off all BCS anthologies and back issues. That includes all our previous anthologies, Best of BCS Year One, Year Two, Year Three, Year Four, and Year Five, our steampunk anthology Ceaseless Steam, and our new Weird Western anthology Ceaseless West. It includes back issues of BCS at Weightless Books: all 182 issues of BCS going back to #1 in 2008, including ones not available at any other retailer or on our website. It includes the 25-issue bundles of back issues, such as the brand new bundle with BCS #151-#175. It also includes all BCS subscriptions; you can use the coupon to renew your subscription no matter when it’s set to expire. The Best of BCS, Year Six has twenty-two stories for only $3.99, including by Yoon Ha Lee, Helen Marshall, Richard Parks, Gemma Files, Seth Dickinson, Cat Rambo, and more. It features “No Sweeter Art” by Tony Pi, a finalist for the 2015 Aurora Awards and 2015 Parsec Awards, and “The Breath of War” by Aliette de Bodard, a finalist for the 2014 Nebula Awards. BCS ebook subscriptions are only $15.99 for a whole year/26 issues (that’s less than 30 cents a story!). Subscribers can get issues delivered directly to their Kindle or smart phone (any device with an email address), and they get the issues early, a week before the website. The sale will end soon, so make sure you buy your BCS subscription or Best of BCS Year Six at WeightlessBooks.com soon! 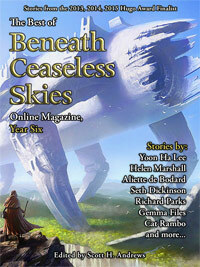 New Best of BCS Year Six Anthology Now Out! These and other awe-inspiring fantasy stories await in The Best of Beneath Ceaseless Skies, Year Six, our new ebook anthology of twenty-two stories from the sixth year of BCS, out now at major ebook retailers. The Best of BCS, Year Six features such authors as Yoon Ha Lee, Helen Marshall, Richard Parks, Gemma Files, Seth Dickinson, Benjanun Sriduangkaew, E. Catherine Tobler, and Cat Rambo. It includes “No Sweeter Art” by Tony Pi, a finalist for the 2015 Aurora Awards and 2015 Parsec Awards, and “The Breath of War” by Aliette de Bodard, a finalist for the 2014 Nebula Awards. The Best of BCS, Year Six is available for only $3.99 at many ebook stores, including Amazon Kindle Store, Kobo, B&N and Apple’s iBooks/iTunes (Sept. 12), and Weightless Books. All proceeds go to pay BCS authors and artists for their work. Pick up a copy today, to get some great BCS stories in a handy collection and support us at the same time.